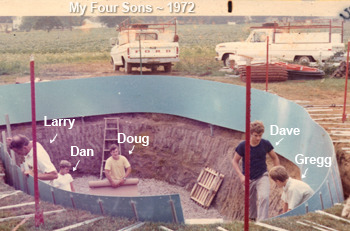 Pool builders were scarce when our founder, Larry Mossing, was shopping for an in-ground pool for his family. A plumber by trade, he decided to tackle the project himself and with the help of friends finished his first pool in the summer of 1965. Soon, requests were pouring in for Larry to construct pools in neighboring backyards. Larry Mossing and Sons Pool smiths was soon formed and was located on Maple St. in Metamora, OH. After a few years of experimentation with vinyl liners and fiberglass panels, he stumbled upon an up-start, Family Fun Pools of Louisville, Ohio who's system featured a free form fiberglass wall and a poured concrete bottom. He liked the ease of construction, strength, and flexibility, so he quickly renovated his existing vinyl liner with a Family Fun system. That was 1969 and we haven't looked back! We have now been building the same type of pool for over 50 years. Larry's son, Dave, took the reigns in 1998, dropped the "and Sons" and continues to manage the company as Mossing Pools. As Mossing Pools flourished under Dave, the company required more space for equipment, vehicles, and inventory, so in 2002 Dave built a new shop on a sprawling lot just south of Metamora. Currently, Dave manages all Mossing Pools operations with the help of his son, Luke, who Dave plans to hand the business over to when the time comes.